land, a clear sign of the area’s historic strategic importance. 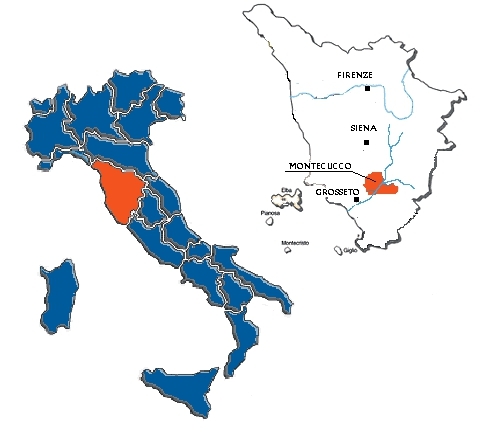 It later passed under Sienese control, and Amiata was accorded a new role with the Medici family, who ruled the area at length. The nineteenth century was marked by the discovery of minerals to be mined, and this phase continued for more than one hundred years. When the mines closed – leaving traces in a number of museums – the area converted to top quality farm and developed as well an excellent farm holiday hotel network. It is within this profoundly traditional context that vine growing developed. From the starting point of the Etruscans, whose wine growing techniques have been rediscovered and reproduced, vines and wine have been our people’s life companions over the years, colouring our fields, laying our tables and giving us our livelihood and trade which, initially local and confined to grapes, now supplies certified wines to every corner of the world. In this sense, a landmark was the 1970s recognition of the two geographic denominations in our area, the forerunners of DOC Montecucco, which took definitive shape when the 1998 Designation of Origin was awarded it.